Cost effectiveness of interventions having long term impacts rather than immediate effects don’t always appear to be the best economic choice for companies. In the interest of sustainability, can a company afford not to invest in a sound hearing conservation programme? What are the benefits - or consequences? High levels of noise are perhaps the most pervasive and widespread occupational hazard in industrialised nations around the world. Noise induced health effects are considered an emerging environmental burden of disease by the World Health Organization (WHO). Exposure to noise not only causes noise induced hearing loss (NIHL); it is a contributing factor to numerous non-auditory health outcomes and workplace accidents, all of which come with a hefty price tag attached. Occupational noise induced hearing loss (NIHL) is 100 percent preventable. No worker should incur an occupational hearing loss. Developing and implementing an effective occupational hearing loss prevention programme requires commitment by both management and workers. Everyone wins when a company has an effective occupational hearing loss prevention programme, including employers, the employees, and the safety and health professionals tasked with implementing the programme. Responsible, conscientious employers want to protect their employees from a totally preventable and unnecessary loss of hearing - as well as protect themselves from legal and economic repercussions. Valuable, hardworking employees need their hearing to serve their ability to communicate. Occupational hearing loss creeps up slowly, and many workers are unaware of their impairment until permanent, irreversible damage has already occurred. A good occupational hearing loss prevention programme can identify minor changes in hearing before permanent damage is incurred. Hearing loss due to noise is likely to appear during the first five to ten years of exposure. Younger workers are more at risk of both NIHL and non-auditory effects of noise exposure. An occupational hearing loss prevention programme may detect hearing loss due to causes other than workplace noise exposure. Hearing loss due to impacted earwax, an ear infection, or possibly a more serious disease may be identified and medically treated before permanent damage occurs. Engineering controls for occupational hearing loss prevention are defined as: “Any modification or replacement of equipment, or related physical change at the noise source or along the transmission path (with the exception of hearing protectors) that reduces the noise level at the employee’s ear” (NIOSH). Typical engineering controls include enclosures, sound-attenuating materials, mufflers, and baffles used for: • Reducing noise at the source • Altering the noise path • Reducing reverberation • Reducing equipment vibration Incorporating engineering controls during the design phase is more cost effective than retrofitting them. Substituting sound absorbent materials, modifying equipment structure or mechanical processes, and isolating sources within equipment can substantially reduce noise levels. A ‘buy-quiet’ policy for new equipment acquisitions should be adopted by management. Any reduction in noise level, even if only a few decibels, makes the noise hazard more manageable, reduces the risk of hearing loss, improves communication, and lowers non-auditory health effects. Reducing noise levels to an acceptable level via the use of engineering controls minimises expenses related to providing hearing protectors, education and motivation programmes, and programme evaluation. Administrative controls are changes in the work schedule or operations that reduce a worker’s noise exposures when engineering controls inadequately reduce noise levels. Workers can be scheduled so that their time in a noisy environment is minimised, if possible. If extremely noisy operations are unavoidable, the number of workers permitted to work in that environment should be minimised. Administrative controls should never result in exposing more workers to noise. Management should provide a quiet, clean lunch and break area to give workers periodic respite from workplace noise. Hearing protectors should be considered the last line of defence against hazardous noise. They can fail due to: • Discomfort • Incorrect use with other safety equipment • Dislodging • Deterioration • Abuse Hearing protectors provide greatest protection from high frequency noise and significantly less protection from low frequency noise. If their use is carefully planned, evaluated, and supervised, hearing protectors can work as a short term solution to prevent NIHL. Hearing protectors not only protect hearing, they improve health and wellbeing. The best hearing protector is one employees actually use, and employees involved in selecting hearing protectors use them more often. Selection of hearing protectors must take into consideration compatibility with other PPE and workplace conditions such as temperature, pressure and humidity. According to NIOSH, factors determining the likelihood of worker acceptance/compliance include: • Convenience and availability • Belief that protectors can be worn correctly • Belief that protectors will prevent hearing loss • Belief that protectors will not impair one’s ability to hear important sounds • Comfort/fit • Adequate attenuation • Compatibility with other required PPE Offer a variety of types and styles and provide individual training on proper fit and use. Encourage workers to take earplugs home to protect their hearing. Wearing hearing protectors correctly is of crucial importance. Intermittent wear will drastically reduce effective protection (NIOSH). Many methods exist for estimating the amount of sound attenuation provided by hearing protectors. Most are based on laboratory data obtained using controlled conditions. Noise reduction actually experienced in the workplace can be significantly lower than ratings derived from laboratory data suggest. Hearing protector ratings should be de-rated by a factor that correlates to real world data. Audiometric evaluation is crucial to the success of any HCP. It is the only way to determine whether occupational hearing loss is being prevented. Occupational hearing loss occurs gradually - affected employees often do not notice changes in hearing ability until a large change has occurred. Annual comparison of audiometric tests allows for prompt hearing loss programme interventions. Protective measures can be initiated. Workers can be motivated to proactively participate in preventing further hearing loss. Audiometry must be conducted by a certified audiologist, a physician, or by an occupational hearing conservationist. Audiometric testing should consist of pure-tone air-conduction threshold testing of each ear at 500, 1,000, 2,000, 3,000, 4,000 and 6,000 Hz. These frequencies are important in deciding the probable etiology of a hearing loss. The success of any HCP depends on support from management, enforcement of safety policies, ongoing worker education and motivation tailored to specific exposure and prevention needs, and hearing protectors that are both comfortable and effective. Workers must be informed about the reasons for and the requirements of the HCP at the time that they are enrolled. Education and training is ineffective unless it can be related to each worker’s day-to-day functions (Berger 1981). Training must be provided (according to applicable regulations) to employees exposed to noise. Workers must be informed of the possible consequences of noise exposure and various control measures to protect their hearing. Information must be updated to be consistent with any changes in protective equipment and work processes. Employees should have access to information and training materials. Overall effectiveness of an HCP should be evaluated in terms of the hearing losses prevented for each worker and the overall rate of hearing loss in the population of workers. This evaluation should occur on a continual basis and trends should be closely monitored to identify problems before many individual threshold shifts occur. Integrity of the audiometric data should be evaluated and the rate of threshold shift among noise-exposed workers compared to that of persons with no exposure to occupational noise. Individual effectiveness of an HCP is best evaluated through audiometric monitoring of each worker with the potential for noise exposure. A baseline audiogram should be established for all new employees or all affected employees in the case of a new programme. Comparison of a current audiogram with the baseline audiogram will allow assessment of the programme for that worker. Any apparent changes in hearing, even if slight, could indicate a failure in the programme. A Zero Tolerance approach for occupational hearing loss along with a commitment to investigate the cause of every single change in hearing, for each person affected by HCP, should ensure effectiveness of the programme. Exposure to harmful sounds causes damage to the hair cells as well as the auditory nerve. Most occupational NIHL occurs around 4,000 Hz. A 4,000-Hz dip is often observed on an audiogram of a worker in the initial stage of noise-induced hearing loss, but other ranges, even if damage is acquired outside the workplace, can affect a worker’s job performance and contribute to rising healthcare costs. Occupational noise is associated with most types of work activities. Some occupations, including manufacturing, transportation, mining, construction, and the military are linked to higher risks of developing NIHL and other adverse health outcomes. Occupational noise exposure and NIHL negatively impact everyday safety and health in the workplace, resulting in loss of productivity and capital. Absences attributed to compromised health status increase as noise exposure increases. Rising insurance premiums and compensation doled out for industrial injuries and sick leave can be quite costly. A clear, mechanistic pathway between noise and damage to the auditory system is biologically obvious and generally accepted. Scientific evidence showing a strong association between NIHL and effects of occupational noise that increase with magnitude and duration of noise exposure supports this link. 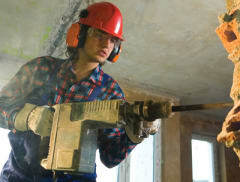 Workers with pre-existing conditions may be more vulnerable to noise. Prolonged exposure is suspected of leading to cumulative effects for at-risk segments of the population, increasing associated costs. Intensity, frequency, complexity and duration of unwanted sound determine how it affects human wellbeing. Subjective loudness increases at a slower rate than sound energy or sound pressure. Listeners judge the loudness as doubled only after an increase of 10 decibels (dB). Sound pressure levels (SPL) increase by 6 dB when sound pressure doubles. An increase of 20 dB results from multiplication of sound pressure by a factor of 10. Doubling sound energy only increases perceived loudness by 3 dB. Exposure may be augmented by a number of variables. The combination of noise plus another factor like vibration, ototoxic chemicals or drugs, is additive and produces responses that are not possible by the individual factors. Very little is known about how the effects of multiple variables sum up. Significant economic and productivity losses for industry can be attributed to work-related accidents. Workplace safety is compromised by the disruptive effect of noise, and NIHL. Accident investigations indicate a lack of awareness of these effects and the associated risks. Although it may be difficult to separate the contributions of noise from other environmental conditions, it is undeniably a contributing factor in increased accident rates. Accidents are estimated to be as much as three to four times more prevalent in noisy environments. When exposed to noise in the workplace at levels ≥80 dB(A), especially where either temporary or permanent hearing loss has been induced, workers are likely to experience an increased risk of accidents. As severity of NIHL increases, so does the risk of accidents. NIHL is thought to have an adverse effect on perception and localisation of environmental sounds, speech recognition, effective communication and warning signals. A recent five year study comprising 43,250 accidents representing 240,000 person-years of observation, indicated up to 12.2% (n=5287) of the accidents were attributable to the combined effect of noise exposure above 90 dB(A) and NIHL (Picard, et al 2008). Workforce retention substantially reduces rising costs of training new employees. Employees exposed to lower levels of noise exhibit more loyalty and have a stronger sense of company attachment. Most choose to remain with the company longer than those working in a noisy, distracting environment. Workers often base job satisfaction on perceived noise levels. • Increased noise levels = decreased job satisfaction • Increased noise levels = decreased company loyalty Noise, or unwanted sound negatively affects job performance, although performance levels are sometimes upheld at the price of increased stress. As noise levels increase, performance decreases. Critical thinking is impaired and problem solving abilities diminish. Error rates increase, leading to workplace accidents and decreased profits. Ability to perform complex tasks diminishes. Degradation of working memory occurs. Auditory stressors increase norepinephrine and cortisol activities, negatively affecting cognitive performance. In one European Union survey, 28% of workers reported working conditions exposing them to noise loud enough that they had to raise their voices to communicate with co-workers at least 25% of the time (EASHW, 2000). Inability to easily communicate with co-workers interferes in complex task performance and lowers productivity. An unwillingness to help one’s co-workers develops. Increased anger and aggression may lead to workplace violence. Noise levels in the workplace can also lead to sleep disturbances. When combined with shift work, the effects are additive. Lack of sleep negatively affects job performance. The auditory system is our main sensory warning system, actively and continuously analysing, filtering, and interpreting acoustic information. According to WHO, health is a state of complete physical, mental, and social wellbeing. Very little doubt exists that annoyance from noise adversely affects wellbeing. Noise induced annoyance is defined as: “A feeling of resentment, displeasure, discomfort, dissatisfaction or offence which occurs when noise interferes with someone’s thoughts, feelings, or daily activities.” (Passchier-Vermeer, 1993). Quiet periods away from the workplace are thought to facilitate physical recovery from daytime noise levels endured in the workplace. Sleep modulates cardiovascular function. Trouble falling asleep and sleep fragmentation could enable development of cardiovascular disorders. Why wait? Implement a holistic environmental noise management programme aimed at reducing noise levels into your company’s overall health and safety programme. The importance of recognising noise induced health effects, NIHL, or the combination of the two as risk factors for increased workplace accident rates is tremendous. Immediate attention and action of all Health and Safety professionals is called for. Decreased accidents are a very compelling argument for reducing noise in the workplace - and remember, work related accidents result in significant capital and productivity losses for industry. An effective hearing loss prevention programme is good business. While there are costs associated with implementing the programme, it is a necessary investment and will produce a beneficial return. Companies that have implemented hearing loss prevention programmes show significant reductions in accident rates, illnesses and lost time. Taking the appropriate preventive action now will greatly reduce the risk of future claims and liabilities.